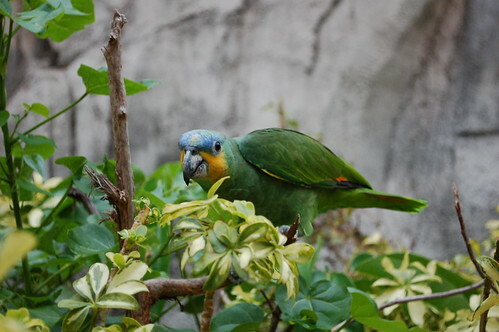 Why Do Parrots Do What They Do? Parrots are very productive creatures. All of their daily activity shows purpose and a striving towards a goal. There is nothing that they do that doesn’t benefit them in some way. Foraging for food, preening, nest building all serve a clear purpose. Even play is beneficial. A young bird learns about the agility of its body. It learns about defense, how to apply and withdraw force and builds its confidence. 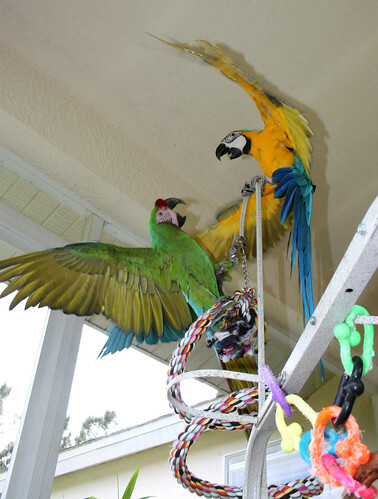 Birds are very social beings, and play continues throughout adulthood. And they perform other behaviors, the purpose for which may be less clear. Screaming is a behavior that is hard to understand, especially when the outcome is usually an angry owner and a locked or covered cage. So where is the benefit in that? Consider the scream a call for attention, or to call your attention to some need. While you’re running around trying to figure out what to do for him to get that screaming to stop, he has already gotten what he wants: your attention. Also, your frenzy was probably quite amusing to him to watch – benefit #2. Don’t confuse screaming with the twice daily (or so) contact call. In the wild, this is normal morning and evening behavior. In the morning, it’s a greeting, in the evening, a call to bring the flock home for the night. This is what parrots do. It’s healthy flock behavior, and to be expected. Don’t try to discourage it – there’s a reason and purpose for it. Parrots don’t bite without cause. It might be a warning because they feel threatened, or an outright attack after you’ve failed to heed the warnings (they are always there). They have also been known to bite just to watch you dance around the room yelling “Ow, ow, ow.” How fun is that?? Another thing they do that puzzles me, but I find hilariously funny, is teasing. We’ve heard the stories of the african grey that perfectly mimics a ringing phone and cackles with laughter while the owner scrambles across the room to answer a dial tone. Or the parrot who whistles for the dogs and then yells at them (in the owner’s voice) to go back in the other room. What is the benefit of this? Practicing manipulative skills? Most likely it is just amusement and fun. You can’t put a price on that. Maybe your parrot sees it as their job to shake things up every now and again when things get too slow for their quick thinking minds.